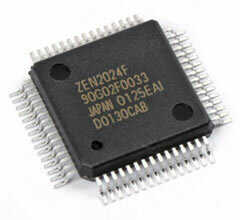 ZEN2024F is a 24-bit 2ch ultra-high speed programmable universal counter IC. It can count 2 phase pulse signals and up / down pulse signals output from rotary encoders, linear scale etc etc. Compared with the conventional ZEN2011P, the counter response speed has been increased to 4 times that of 33 MHzmax, and 2 channels are incorporated in the QFP 60-pin package to improve mounting efficiency. Also, it is compatible with ZEN2011P on software.